Arthroplasty is a procedure that the surgeon removes part of one of the toe bones, the phalangeal head, so that the toe can lie flat. Hammertoe surgery is a common procedure performed by podiatrist. This simple surgery is performed as an outpatient procedure and only takes about 30-45 minutes to complete. Some podiatrist can perform the procedure in their office, but must have a HEPA filter or a specific surgical suite with a medical assistant. The majority of the time the hammertoe surgery will be done in a hospital or surgery center. Depending on the severity of the hammertoe, the surgery will need about 4-6 weeks for recovery or return to work. 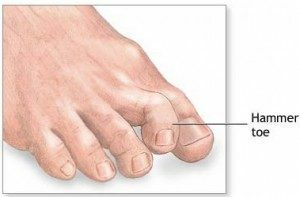 If the hammer toe deformity is severe then the recovery time will be 8-10 weeks. Most likely a pin or metal type implant will be used to keep the toe straight after the hammertoe surgery is performed. In this episode of my podcast, I talk about the financial waste of the overuse of expensive implants in hammertoe surgery. Most of the time a simple inexpensive k-wire can be used to support the hammertoe repair and then the wire can be safely and painlessly removed in 4-6 weeks after the surgery. I some cases, depending on the evaluation of the hammertoe, the surgeon may be able to perform a soft tissue transfer or also known as a flexor tendon transfer instead of using a k-wire. To easily describe how a tendon transfer works is like using tape and pulling the toe down and straight. 2. Bone regeneration can lead to bone spurs. 3. Scarring and nerve impingment. 4. Hyperthrophic scar or hyperpigmentation or depigmentation or keloid scars. 5. Nonunions or delayed unions.